Defrauded customers of Samen Gold in Tehran were battered by the regime’s State Security Forces (SSF) while gathering to protest in front of Tehran’s prosecutor’s office on Sunday, April 14, 2019. The defrauded customers of Samen Gold have staged numerous protest gatherings since last year. They have lost their investment and received no answer of compensation for that. On April, 14, to disperse their protest gathering the SSF battered the participants. These suppressive agents including a colonel, beat women. A protester confronted them by shouting: “Why do you permit yourself to beat women?” Many of the participants were arrested. Defrauded customers of various regime financial institutes have staged several protest during the past days too. 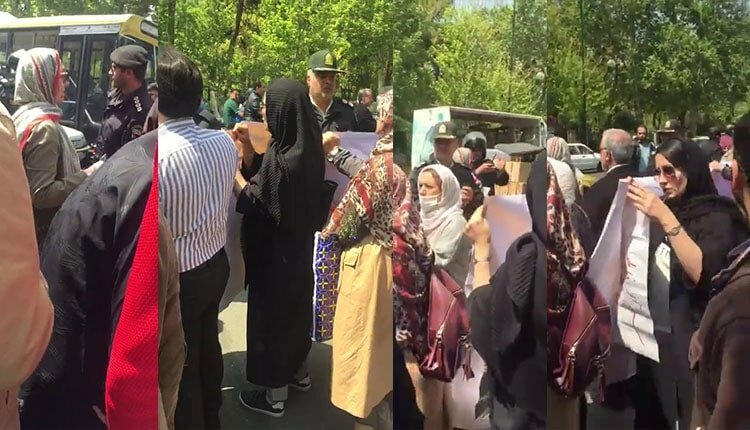 On Tuesday April 9, 2019 the defrauded customers of Padideh Shandiz Institute in Mashhad gathered in protest in front of the regime’s prosecutor’s office of the city. On Tuesday, April 9, 2019 a huge crowd of Isfahan’s Steel Company’s retirees gathered in front of the city’s governorate to protest the non-payment of their premiums and their bonuses for the last year. They have been paying for this insurance for 30 years. During the protest gathering they were sieged by SSF and plainclothes.